Perhaps the earliest visitors to the Las Vegas area were nomadic Paleo-Indians, who traveled to the area 10,000 years ago, leaving behind petroglyphs. Anasazi and Paiute tribes came here at least 2,000 years ago. The area was named Las Vegas, which is Spanish for the meadows, in the 1800s because it featured abundant wild grasses, as well as desert spring waters for westward travelers. The year 1844 marked the arrival of John C. Frémont, whose writings helped lure pioneers to the area. Downtown Las Vegas’ Fremont Street is named after him. Eleven years later, members of the LDS Church chose Las Vegas as the site to build a fort halfway between Salt Lake City and Los Angeles, where they would travel to gather supplies. The fort was abandoned several years afterward. The remainder of this fort can still be seen at the intersection of Las Vegas Boulevard and Washington Avenue at the Old Las Vegas Mormon Fort State Historic Park. Las Vegas was founded as a city in 1905, when 110 acres of land adjacent to the Union Pacific Railroad tracks were auctioned in what would become the downtown area. In 1911, Las Vegas was incorporated as a city. The year 1931 was a pivotal one for Las Vegas. At that time, Nevada legalized casino gambling and reduced residency requirements for divorce to six weeks. This year also witnessed the beginning of construction on nearby Hoover Dam. The influx of construction workers and their families helped Las Vegas avoid economic calamity during the Great Depression. It was completed in 1935. The 1950s saw the opening of the Moulin Rouge Hotel, the first racially integrated casino-hotel in Las Vegas. In 1951, the first atomic bomb detonation at the Nevada Test Site, 65 miles northwest of Las Vegas, occurred. City residents and visitors were able to witness the mushroom clouds until 1963, when the Limited Test Ban Treaty required that nuclear tests be moved underground. In 1989, entrepreneur Steve Wynn changed the face of the Las Vegas gaming industry by opening up The Mirage, the Las Vegas Strip’s first mega-casino resort. This strengthened the pull of visitors away from the downtown area. In 1995, the Fremont Street Experience in Las Vegas’ downtown area was opened. This canopied, five-block area features 12.5 million LED lights and 550,000 watts of sound from dusk until midnight during shows held on the top of each hour. Downtown is a hub for arts and culture in the metro area. The main venue for performing arts is the Art Deco-inspired Smith Center for the Performing Arts. In addition to The Smith Center and 18b, The Las Vegas Arts District, there are a number of educational facilities in the Cultural Corridor, located just north of the immediate downtown area. They include the Las Vegas Natural History Museum, the Neon Museum and Boneyard and the Old Las Vegas Mormon Fort State Historic Park. Also in this area are a number of neon signs from former Las Vegas casinos and landmarks, which have been restored and installed on several streets around downtown, as well as throughout the Fremont Street Experience. A famous neon icon of downtown Las Vegas is the Vegas Vic sign, also located at the Fremont Street Experience. Downtown serves as a main center for government services in the Las Vegas Valley. Government offices for the city of Las Vegas and Clark County are located here, as well as the Las Vegas Metropolitan Police Department and several courts. Some former government buildings have been turned into attractions, such as the old Las Vegas Post Office and Courthouse becoming the Mob Museum. Two major freeways—Interstate 15 and Interstate 515/U.S. Route 95—cross in downtown Las Vegas. RTC Transit is a public transportation system providing bus service throughout Las Vegas, including the downtown area. The Downtown Loop is a free shuttle servicing many attractions in downtown Las Vegas. The Loop runs continuously during operating hours and arrives at each stop every 20 minutes. The hours of operation are Monday through Thursday: 11:30 a.m. to 8:30 p.m.; Friday through Saturday: 3 p.m. to 12 a.m.; Sunday: 10 a.m. to 7 p.m. The AAA Free Self-Driving Shuttle is a pilot program that provides rides in the Fremont East Entertainment District Nov 2017 – Nov 2018. 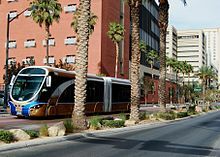 The pilot program is a partnership with Keolis, the city of Las Vegas, and the Regional Transportation Commission of Southern Nevada. 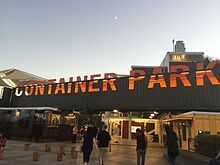 The shuttle runs Tuesday – Sunday 4:30pm – 8:30pm, with the main station stop at the Downtown Container Park. Shuttle service is suspended during the month of August. Downtown Las Vegas also houses some corporate offices, as well as the World Market Center Las Vegas, a frequent host of trade shows and conventions. Recently, the opening of the Cleveland Clinic Lou Ruvo Center for Brain Health and the arrival of the new Zappos headquarters downtown has started to attract new medical and technology-oriented businesses to the area. The downtown area in recent decades has played second fiddle to the larger and more famous Las Vegas Strip, which is located a few miles to the south. The city has been working on revitalization efforts to entice more visitors and residents to the downtown area. The square footage of World Market Center Las Vegas is greater than both the Willis Tower in Chicago and the Empire State Building in New York City. The 1971 James Bond film Diamonds Are Forever featured a chase scene in which James Bond, running from Las Vegas police, side-rolls a car through an alley exiting onto Fremont Street. The 1987 music video for the song " I Still Haven't Found What I'm Looking For" by U2 was filmed on Fremont Street and featured the band members wandering around, while The Edge played an acoustic guitar. Very Bad Things (1998) featured Fremont Street in the movie. Honey, I Blew Up the Kid (1992) prominently featured Fremont Street in the movie. Cool World (1992) showed all the animation coming out of the Plaza hotel and going down Fremont Street. In 1994, Glitter Gulch was featured prominently in the TV Miniseries The Stand. The 1997 comedy Vegas Vacation includes a few scenes on Fremont Street. In the 2004 movie Dodgeball: A True Underdog Story, Steve the Pirate is seen along the Plaza near the Fremont Street Experience. In a 2005 release, Panic! at the Disco released a song about cheap motels on Fremont Street called " Build God, Then We'll Talk." The 2007 film Next, has Nicolas Cage's character entering the Golden Nugget from the Fremont Street Experience. Ice Cube's music video for "Chrome and Paint" took place on Fremont Street, with Ice Cube in a lowrider. In the video game, Tom Clancy's Rainbow Six: Vegas, Logan Keller, and his teammates Jung and Michael, infiltrate Fremont Street to find a news van, which they find by going through the maintenance tunnels under the "Stocco Casino." Heavily referenced in the Tom Waits song "Mr. Siegal." Featured at the beginning of the TV Series CSI season 7 finale episode 24. Featured in the opening credits of the TV series Vega$. Magician and illusionist Criss Angel has done many demonstrations and TV specials there. The reality television series Pawn Stars is filmed at the Gold & Silver Pawn Shop located on Las Vegas Boulevard, which features other prominent members of the downtown community, most notably Jesse Amoroso from Cowtown Guitars who appears as a reoccurring guitar expert on the show. ^ Schoenmann, Joe (March 19, 2014). "Joe Downtown: The boundaries of downtown Las Vegas are as fluid as its reputation". Las Vegas Weekly. Retrieved March 29, 2014. ^ "History (Official City of Las Vegas Web Site)". Archived from the original on 2005-07-27. ^ "Las Vegas: 10 Things to Do — 10. Downtown - TIME". Time. ISSN 0040-781X. Retrieved 2017-02-28. ^ "Downtown Las Vegas to get new $76M expo center". 29 March 2018. ^ "Downtown Las Vegas, Nevada". Archived from the original on November 20, 2008. Retrieved December 20, 2008. ^ a b "lasvegasnevada.gov" (PDF). www.lasvegasnevada.gov. Retrieved 6 April 2018. ^ "Fremont East Entertainment District". ^ "PHOTOS: Fremont East Gets Glamour Treatment". Las Vegas Review-Journal. 2007-08-25. Retrieved 2007-08-27. ^ "Third Street has potential to be night life magnet". Las Vegas Review-Journal. 2004-09-18. Retrieved 2007-08-27. ^ "18b, The Las Vegas Arts District website". ^ "The Las Vegas Arts District". www.18b.org. Retrieved 2017-02-28. ^ "lasvegasnevada.gov". www.lasvegasnevada.gov. Retrieved 2017-02-28. ^ "First Friday Monthly Art Festival - First Friday Foundation". First Friday Foundation. Retrieved 2017-02-28. ^ "Union Park Overview". Archived from the original on December 8, 2008. Retrieved December 20, 2008. ^ "The Smith Center website". ^ a b "DISCOVERY Children's Museum". ^ "City of Las Vegas website". ^ "Old Las Vegas Mormon Fort State Historic Park website". ^ Jarvis, Katherine (13 April 2018). "Cannabis museum coming to downtown Las Vegas". ^ "Giant bong, huggable buds: Marijuana museum opens in Vegas". September 20, 2018. ^ "18b, The Las Vegas Arts District website's antique and vintage stores page". ^ "About the Historic 5th Street School - American Institute of Architects Las Vegas". ^ "Architecture Studies Library - University Libraries". ^ "Symphony Park (Official City of Las Vegas Web Site)". ^ Ron Sylvester. "Downtown casino renovations maintain Old Vegas vibe". LasVegasSun.com. ^ Cy Ryan. "Strip gaming revenue rose 3.3 percent in February". LasVegasSun.com. ^ "Elks Helldorado Days Official Website - Join us May 14-17, 2015". ^ "Life is Beautiful Life is Beautiful". Life is Beautiful. ^ Ken Miller (7 March 2013). "New Discovery: Children's museum opens this weekend". LasVegasWeekly.com. ^ Joe Schoenmann. "Joe Downtown: Construction to begin on downtown beautification project". LasVegasSun.com. ^ "What Happens in Brooklyn Moves to Vegas". The New York Times. 21 October 2012. Wikimedia Commons has media related to Downtown Las Vegas.